WASHINGTON, DC, February 2, 2015 (ENS) – President Barack Obama set a goal in his 2011 State of the Union speech – put one million electric vehicles on the road by 2015. But auto analysts and executives doubted that was possible. Turns out the doubters were right. U.S. car dealers have sold just over 250,000 electric vehicles since they were introduced in 2010. The latest statistics from Argonne National Laboratory show U.S. car dealers sold 97,101 electric vehicles in 2013 and 118,882 in 2014. U.S. car dealers sold more than 13 million petrol-powered passenger cars, light pickup trucks, SUVs and vans in 2013 and more than 14 million in 2014, according to motorintelligence.com, a site provided by Autodata Corp. The U.S. Department of Energy says the high purchase price of EVs is partly to blame. Electric vehicles range in price from about US$15,000 to more than $70,000. At the upper end of that scale, the purchase price can be prohibitive. “While the market is growing quickly, additional cost reduction of electric vehicle technology is required to directly compete on a cost basis with conventional vehicles,” says Rueben Sarkar, the Energy Department’s deputy assistant secretary for transportation. EVs are cheaper to operate than petrol-powered cars and trucks in the long run and they produce no air pollution. Nor to they contribute to climate change. But American drivers have been slow to switch. Trying to solve the riddle of Americans’ sluggish acceptance of electric vehicles, Lang Tong and Shanjun Li, researchers at Cornell University, frame the issue as a traditional chicken and egg riddle – which came first, the chicken or the egg? 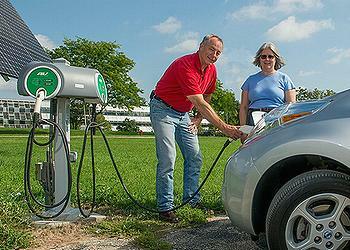 The chicken is the limited number of EV charging stations in U.S. cities and along highways. Tong and Li contend this poses a major roadblock to greater acceptance because recharging EVs can be inconvenient, if not impossible, in many places. The egg is that investors are reluctant to build more charging stations, when there are so few electric vehicles on the road. Through their research Tong and Li found that cities with more charging stations also have more electric cars. In their analysis, a 10 percent increase in the number of charging stations per million people in a city would result in a 10.8 percent increase in the market share of electric vehicles in that city. They say more charging stations are needed in parking garages in urban centers, parking lots in shopping malls, apartment complexes and business sites. One goal of Tong’s and Li’s INSPIRE project, entitled “An Engineering and Economic Pathway to Electric Vehicle-Based Transportation,” is to consider how to engineer transformative technologies for large scale charging of electric vehicles that can work with existing electric grids in a cost-effective way. Currently, most EV owners plug in to a standard 120-volt home outlet and charge their batteries overnight. Others pay to install a 240-volt charging station at home, cutting charging times roughly in half. A third alternative is to purchase an electric vehicle equipped with electrical connections for high, direct-current charging. This can recharge an electric vehicle four to six times faster than an alternating current charger; but the cost typically runs $15,000 to $25,000. Tong and Li believe more efficient charging options that lower electricity costs would speed up electric vehicle adoption. They are investigating vehicle charging with solar panels on garages, examining possibilities for local energy storage and studying how to better utilize price differentials in the electricity market. They also are designing efficient, large-scale charging facilities using an Intelligent Energy Management System that optimizes the cost of vehicle charging at malls or parking garages where many cars could draw energy from the power grid all at once. By determining which cars to charge at any given time and which to defer to a later time, an IEMS can reduce both costs and strain on the grid. But recharging is just one among many factors that influence the decision to buy an electric vehicle. “The $7,500 tax credit policy for which electric vehicle buyers are eligible contributed to about 48.5 percent of electric vehicle sales from 2011 to 2013, which is a , tax creditsignificant portion,” says Li, an environmental and energy economics assistant professor at Cornell. Some would consider the tax credit policy a success, but Tong and Li don’t share that view. They say the $1.05 billion handed out in subsidies to EV buyers could have been used to build more than 60,000 charging stations instead – a number equal to about half the total number of gasoline stations in the United States – and they calculate 60,000 new charging stations could have meant five times more electric vehicles sold. Still, Tong and Li say the tax subsidies had a net positive effect, bringing about $200 million in long-term environmental benefits during the 2011 to 2013 study period. The National Science Foundation’s Directorates for Computer and Information Science and Engineering and Social, Behavioral and Economic Sciences (SBE) support Tong and Li’s INSPIRE project. INSPIRE projects are risky, potentially transformative research that is interdisciplinary in scope. “This project is part of a stream of SBE-funded research that considers how individual decisions and market forces determine whether or not new technologies will be widely adopted,” said Nancy Lutz, director for SBE’s Economics Program, which partially funded Tong and Li’s research. “That’s a basic science question. It is, of course, also of key importance for national goals like energy independence,” said Lutz. “The interdisciplinary aspect of this research is to align engineering innovations in on-site renewable sources and local storage with real-time pricing of electricity and flexibility of charging schedules,” said Phillip Regalia, whose Division of Computer and Communication Foundations in CISE funds most of the five-year project.